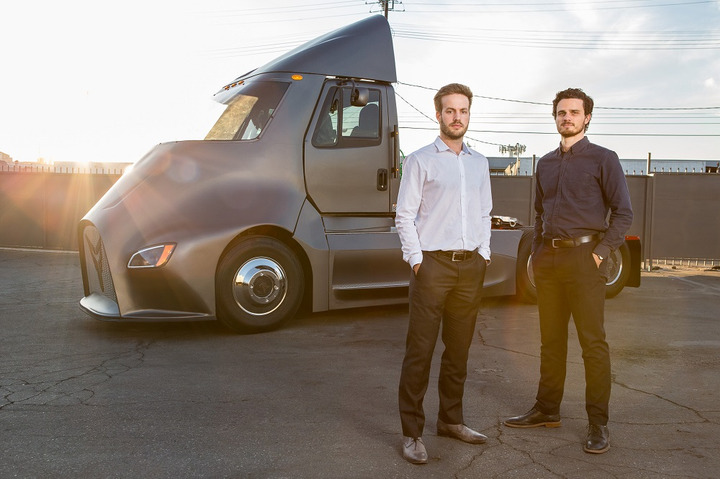 Thor Trucks isn’t looking to “reinvent” the trucking industry, says COO Giordano Sordoni, one of Thor's co-founders with Dakota Semler (both pictured here). Unlike some Silicon Valley startup companies, Thor Trucks says it isn’t on a massive ego trip compelling them to completely reinvent the trucking industry. That’s according to Thor Trucks co-founder and COO Giordano Sordoni, who answered questions on May 22 at the Freightwaves Transparency 18 summit in Atlanta about how his company differs from other electric commercial vehicle manufacturers today. During a 15-minute discussion, Sordoni covered a wide range of topics detailing the efforts he and Thor co-founder Dakota Semler have made to design an electric truck that meets the needs of North American fleets. As it got deeper into the design process, the Thor team quickly realized that in some areas, they were going to have to be innovators. But in other areas, they’d be able to turn to established truck component suppliers to build their truck. At the same time, Sordoni said, his team realized that there are a whole host of reliable, knowledgeable industry suppliers Thor could partner with as they worked on their vehicle design. “We decided that it didn’t make a lot of sense for us to spend time, money, and energy reinventing various vehicle systems when there are any number of excellent suppliers building axles, wheel ends, suspensions, and other components we could use on our trucks,” he said. Naysayers argue that electric trucks don’t make sense in some market segments today. And Sordoni absolutely agrees with that assessment. “I have drivers tell me they fuel up their trucks and run 2,400 miles before they have to find another pump,” he said. “And I tell them: 'Yes. And you’re not my potential customer for that reason.'"